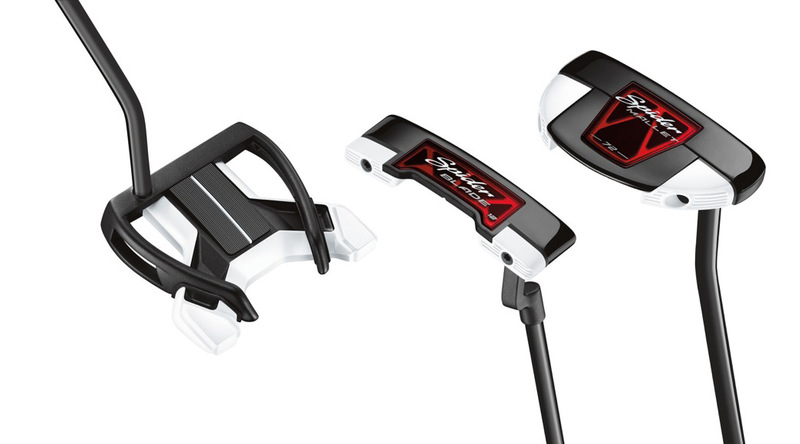 TaylorMade introduce three new counterbalanced putters. Posted September 15th, 2014 by TheGolfersClub & filed under Competitions, Reviews. The new putter range from TaylorMade featured input from staff players Sergio Garcia and Jason Day. With the anchored putting ban coming into effect in 2016, more and more players are turning to the counterbalanced models to create more stability through the stroke. As a result, TaylorMade has announced new counterbalanced models of the Daddy Long Legs, Spider Blade and Spider Mallet, each with Tour-inspired aesthetics. The new designs feature an enhanced colour scheme, including a luxurious black finish and white tungsten heel/toe weights, which frame the ball at address. A matte-black shaft and high-polish sole round out the premium aesthetics. “The new tour-inspired cosmetic is visually stunning, while also delivering the ultimate in stability and performance,” said Tomo Bystedt, TaylorMade’s director of iron, wedge and putter creation. Daddy Long Legs is the most stable putter in the trio, with an MOI (moment of inertia) of more than 8,500. The high-MOI design resists twisting at impact to protect ball speed on off-center hits. At more than 5,200 MOI, the Spider Blade offers the stability of a mallet putter in a blade shape to promote outstanding twist-resistance and distance control on off-center hits. TaylorMade Tour Staff pros who contributed to the development of these premium putters include Sergio Garcia, Jason Day, Boo Weekley and Troy Matteson. Tour tip: To optimise counterbalance technology, grip two to three inches below the top end of the grip when assuming a normal stance, posture and address. By doing so, more weight is “above” the hands, which is key for increasing stroke-stability. Because players should grip down, each new Ghost Spider putter is offered two lengths: 38” and 35”. The 38” is for players who traditionally use a 34”-36” putter, while the 35” option is for players who traditionally use a 32”-34” putter. The Golfers Club is offering six lucky members the chance to win a dozen TaylorMade Project (a) golf balls, RRP £34.99. To enter, simply answer the following question. Q: Which is the most stable putter out of the trio of counterbalanced putters? To enter, email your answer to competitions@twww.golfcare.co.uk with your name, membership number and contact number. The prize draw will take place on 1st October 2014.